Your biggest worry isn't your presentation or your entrance. Your worst nightmare is the person who is introducing you. When the Johnny Carson show was on the air, Carson had a sidekick named Ed McMahon. His job was to introduce Johnny Carson at the beginning of the show. McMahon would say in a melodious tone, "Heeeere's Johnny!" It became his signature line as the audience would eagerly await to hear it in every show. They made a good team. But what about your team? Who is introducing you? If you're giving a presentation, it's normal to have a few butterflies in your stomach. Most public speakers research, prepare, and practice their presentation. Some public speakers hire a coach. Yet, they give little thought about who is introducing them. This is the elephant in the room that nobody is talking about. I once had a woman introduce me who sounded like she was reading a newspaper. She was so dispassionate that you could feel the energy leave the room. It made my job harder to get some excitement going. The speaker introduction is your warm up act. Entertainers understand this. A rock star always has a warm-up band. Comedians know the power of a good emcee. The job of the introducer is to excite and engage the crowd so they'll be ready for the main act. YOU are the main act and that means you need to take charge on two levels. First, choose your introducer carefully. It must be somebody who has good platform skills and enjoys speaking. Second, you need to write your own introduction. Most presenters send their biography to the introducer. A biography is not an introduction. Listening to a resume is boring! So here is a formula you can use to create your speaker introduction. The formula is T.E.P.S. Topic - Begin by announcing the topic. This answers the question, "Why are we here?" or "Am I in the right meeting?" The topic creates focus. You can begin by asking 3 questions, or lead in with a thought-provoking statistic. Expertise - Then launch into the speaker's credentials but don't list every research paper or degree. Present the top achievements that have the most relevance to the audience and that establish the public speaker's credibility. It answers the question, "How have you earned the right to be here?" Personal - Here is where you bring in something about the person that humanizes them. It answers the question, "Do I like the speaker?" or "Who are you as a person?" This is an opportunity to add some humor or a quick anecdote. Be sure to get permission before you share anything personal. Speaker's name - Always end with the speaker's name. "Please help me welcome, John Doe..." People remember the last thing they hear. Public speaking is not rocket science but it does require planning and skill. The next time you give a presentation, choose your introducer, write your own introduction, and coach them on how you want that introduction delivered. Now you're ready to take center stage and give a knockout presentation. Do you have a great speaker introduction you'd like to share? If you've ever had someone introduce you before your talk, you know how that person can make or break your presentation. The introducer is your warm-up act and sets the tone. A dispassionate presenter can take the energy out of the room and put a damper on the event. A good introduction gets the audience ready to receive you and your message. So how does an introduction set you up for success? 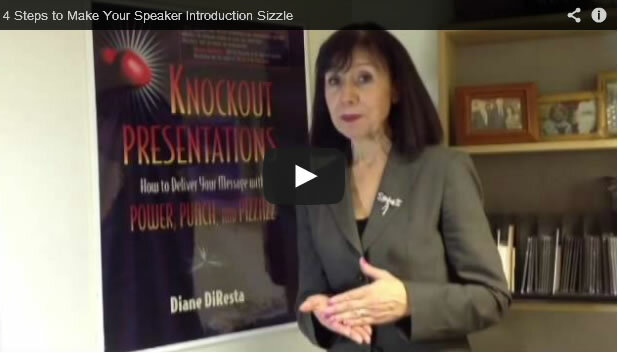 Watch this video and learn a 4 step process for giving a winning speaker introduction.